TPLO surgery for torn knee CCL with severe dysplasia ???? Sweet Buddy2 is just over 3 years old and came in from the yard on three legs late yesterday, no previous gait issue. Apparently turned too fast or something, vet diagnosed torn CCL (ACL in humans) and recommended TPLO surgery. He highly recommended a local canine ortho surgeon. Then, when he came back after seeing Buddy2's X-Rays, he said "we need to back up a bit" . Turns out both of Buddy2's hips are bad. He did not use the word dysplasia. but now that I've seen the X'rays and researched online, I'll call it dysplasia. The left side is severe, thigh bone not even touching the pelvis. Shocking! He zooms! well, he used to. It is the right rear knee that is injured so of course, it's the left side now taking the load. The vet is sending the x'rays and his findings to the surgeon to see if Buddy is a good candidate for TPLO. It is quite an aggressive surgery with long rehab. 40% of dogs have to have their other knee done within 2 years. It is thousands of dollars with potentially severe complications. On NSAIDs for pain until we figure out how best to help him. Poor dude is so lethargic. Does anyone have any experience with torn CCL and/or TPLO surgery? Re: TPLO surgery for torn knee CCL with severe dysplasia ??? I experienced basically the same thing and posted the info under the health discussion section. If this link doesn't work it is on page 2 under health discussion titled ' hip dysplasia, torn ACL , oh my' or something like that. Chloe is now 2 years post op and she has not torn her other ACL as I was warned and so far her hips are hanging in there. Walks are shorter and she occasionally gets a pain pill (usually just when she goes to the groomers) but overall she is doing well at 7.5 years of age. I had an orthopedic specialist do the surgery. It cost around $2700. Rehab was long and hard but honestly worse on me then her I think. She thought she was ok after a few days but of course she wasn't and their activity is severely restricted for 6 weeks and on through like 6 mos. Steps are an issue so we built a ramp and rather than crate her for 6 weeks my hubby built a 4x4 pen for when we were away and I also leashed her to the coffee table so she could be with us watching tv, and at night I closed in an area beside the bed so she could sleep with us. You can do it and of course they are worth it! If you have any questions please don't hesitate to ask or PM me. PS: they often tear the other ACL compensating for the injured leg so be careful. If cost is an issue Care Credit can help and if paid off within a year it is interest free. You can google it. Went through the same with my Sukie. One day after a walk she came up lame... tore the Cruciate Ligament. She also tore the other knee in compensation, so it was 2 surgeries of about $1500 each. After surgery I kept her in a playpen on the deck for outside time and limited her movements for a few weeks to heal. We were lucky that there was an equine water therapy place nearby that also let dogs swim. Sukie took to it immediately and was able to build strength and endurance over a few months of swimming. The exercise kept her weight down which also helps. She takes glucosamine tablets now which also seem to help her knees stay flexible. Good luck! Here's a picture of her doing her thing - after a while she was able to swim on her own without any gear. Last edited by Sukies_Daddy on Tue May 19, 2015 6:09 am, edited 1 time in total. Thanks & WOW! Sukie looks so much like Buddy2! Same color and face structure. On the Weds after the Sat vet visit, I took him to see Dr. Ava Frick, a homeopathic vet here in town. Buddy2 walked in on 4 legs which convinced her it is not a full tear and after looking at his X-rays, said no way she would recommend TPLO for this guy with those hips, at least not yet. She sent me home with MSM & HA & Juncturinum Plex & Chlorophyl Complex & NW Pro-En-Zyme and a scrip for Tramadol along with instx to try to keep him off the steps. I have an Alpha-Stim which I am using on him daily per her instx. We went back in 5 days, he was (and still is using the leg alot more) and she adjusted his back, cut his supplement qtys way down & took him off the Tramadol. We are taking just short walks and he is doing very well. Will try to build activity back in slowly. I am so glad I didn't jump on the surgery right away. Fingers crossed we will avoid it! So glad to hear you took the patient approach. Have had 2 chows that have injured rear legs. About 3 minutes from going ahead with the surgery for our male and decided to step back. Similar approach, glucosamine and MSM. He never had the surgery and is absolutely fine. Lots of money saved and he didn't have to go through the trauma of a surgery. With our female we took a wait and see approach from the beginning. She's a total ham and I am convinced she shaped it up for the attention. Over a year later and she is fine, but will limp just because every so often. Many times its for attention, other times I find that the fur between her paws has gotten longer than she likes it. A quick scissor trim and a dremmel on the nails and she is back to normal (for her). Even with some actual damage, anything other than a complete ligament tear or structural damage can heal if treated properly. Especially in younger dogs (both of mine were about 6 months or so when launching off the couch and sliding on a hardwood floor). It's my opinion that there is little risk in showing patience. In our case, neither dog was sensitive to touch in the area or yelped, etc so we concluded that they weren't in pain. They adjusted to the discomfort by using only the 'good legs'. Very little likelihood that the injury would be worsened. I'm glad you posted an update. I had been checking in to see how he was doing. Chloe had a complete tear and couldn't bear weight so between that and her bad hips and the danger to her other leg I chose/had to do surgery. 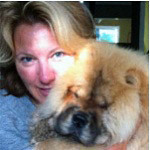 My previous Chow kody had a partial tear at around age 12-13 so with his age I chose the conservative approach. He was still confined for 6 wks but scar tissue forms and he did heal. I hope your guy does well. FuShiLu has blown both hind knees completely, first went at 6 months, healed (scarred) quick, second went at about a year and a half, and took much longer to heal. Now 2 and and a few months of age she is chasing everything and running with lots of other dogs slowly building her strength, over a 100 feet she can shutdown border collies. Many already know of FengHuang passing after we decided on the surgery to rectify her blown knee. Not sure if we can ever go that route again. But some have had success. Since we have met and talked with many owners that have decided to let the healing process go the natural route with such success it is hard to think the nasty surgery is a viable option. Love seems to work best. After all these years of living with dogs, I was so surprised to learn how common this injury is. Buddy2 is doing very well without surgery. Chasing squirrels (I shudder but - he's gotta be a dog) and lifting his "good" leg against trees. Now my focus is on his severe loss of head hair. He hardly even resembles himself anymore. Dr. Frick took a shaving from his belly and we are expecting analysis in a couple of weeks. Over the last 2 years, we have seen 2 different vets at the Animal Medical Center, 2 different vets at my usual (pre CCl issue) vet, and the homeopathic vet, Dr. Frick. Nobody seems to know what the heck is happening. He wasn't scratching. His symptoms don't match any of the canine skin issues I've found online. Dr. Frick suspects hyperthyroid and we are now on a thyroid supplement along with the joint supplements. Hoping for something definitive from the hair analysis. He is starting to re-grow in front of the ears but now he is starting to scratch behind his ears (where he has now broken the skin since there is no hair) and tail and I fear fleas (can't find any) but fear Frontline more, especially now that he is on all these supplements. I gave him his first Frontline of the year in mid April, not since. Hope I don't have to subject him to the E collar. AHH! SOOO want to help this sweet guy. Attaching 2013 pic and today's pic showing the dramatic difference. In 2014 he still had a healthy looking head, just slicker. Now, well, there is definitely something needing fixing. Dr. Frick also said he should have more protein than what was in the Purina Pro Plan salmon formula so I tried easing him into the Blue Wilderness salmon formula, got to 50/50 and he turned up his nose, even with low sodium, low fat chicken broth added to moisten the powder supplements. 4 days now on his sister's Wellness Core grain free which he is eating readily but gave him loose BM 2 years ago. So far so good on that issue. At least his knees are ok - for now!! Can't seem to get current pic to upload but anyway, suffice it to say that Buddy2 is balding in clumps. He's pretty funny looking but just as sweet and loving and seemingly happy as ever.